KU degree latest new semester 1 time table revised 1st year exam dates : The Kakatiya University had announced the KU degree 1st year 1st semester time table December 2016 on the official website @ http://kuexams.org/. The KU university will be conducted the 1st year semester 1 examination in the month of December 2016 which will be start from 15.12.2016. 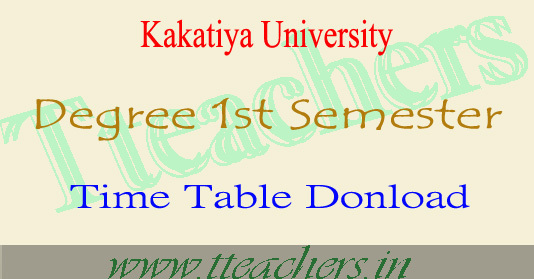 Kakatiya University has released degree (B.A/B.Com/B.Sc/BBA) 1st yeat semester 1 revised and latest new time table 2016 .Which was here under. Many students who are studying degree 1st year are eagerly waiting for this 1st sem 2016 examination dates. All the required candidates can check first year sem 1 time table 2016 and it can be download from this page. Earlier Kakatiya University officials were released press note of exam postponement Now they has announced re schedule of UG Ist Year Ist Semester exams2016. Now here we are updating degree (B.A/B.Com/B.Sc/BBA) Semester 1 latest new updated time table 2016. So all those candidates who are waiting for this 1st semester exams 2016, can check and download 1st sem time table 2016 as given below. 2) Candidates will not be allowed into examination hall after 2.00 PM for after-noon session.